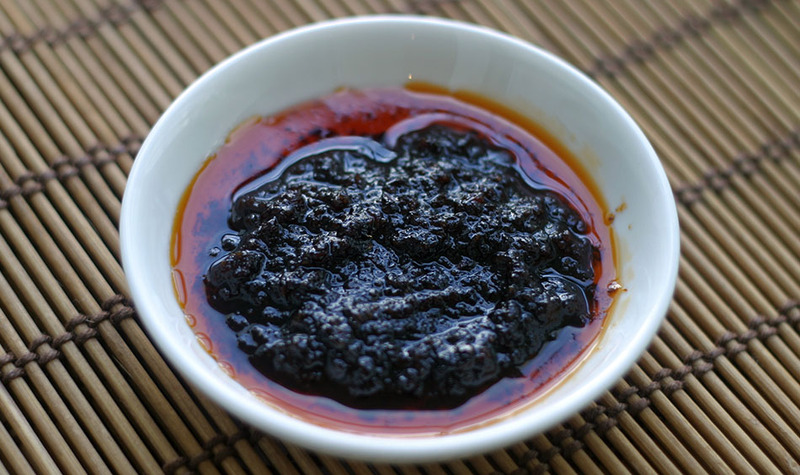 Roasted Chili paste (naam prik pao – น้ำพริกเผา) is a condiment which is used in a variety of dishes, ranging from soups, salads to stir fries. You can even spread it on toast like you would fruit jam. Many people buy this pre-made in jars, but fresh is better! Peel and cut the garlic & shallots thinly and uniform. If they are different sizes they will cook at different speeds, resulting in burning. De-seed the chilies. Fry the garlic in the oil on medium heat until lightly browned. Remove the garlic and set aside. Fry the shallots the same way, and set aside. Fry the chilies until fragrant, but be careful not to burn, then set aside. Fry the shrimp until light browned and fragrant, set aside and keep the oil in the pan. Both the garlic and shallots will continue to cook for a minute or two so don’t take them out too late. Roast the shrimp paste in tin foil in a dry pan (or directly on the burner if you have an electric stove) for about 2-3 minutes on medium heat. Powder each ingredient separately, either in a stone mortar and pestle or in an electric spice mixer. Then mix together. Return the mixture to the pan with the oil along with the shrimp paste. Cook over low heat until fragrant and browned. Be careful not to burn. Add the tamarind, palm sugar and fish sauce. Continue to cook over low heat to reduce a bit to a jam consistency. Store in the refrigerator. It’ll last for a really long time. It's very important you are careful to slice the garlic & shallots the same size. Burned garlic or shallots will ruin the flavor. It's also really important on the 2nd frying not to burn the mixture, or the naam prik pao will taste bitter. Some people dry roast the chilies, feel free to try either way. I'm not sure if roasting the shrimp paste prior to frying really does anything. If you're feeling lazy I think it wouldn't hurt to skip this step. You can skip the shrimp paste and dried shimp altogether and instead add enough salt to taste, probably around 1/2 teaspoon or so. You could also use some sort of dried wheat gluten (powdered first) to give it some texture. Could you please advise, what shrimps are you supposed to use in the making of the Roasted Chilli paste. Are the shrimps fresh or dry? And how long will the paste last. The Ingredients say you require shrimp paste and in the intructions it tell you to fry the shrimps. I’m not really sure how this is supposed to taste… prior to adding the tamarind and sugar (omitted the fish sauce and added a touch of soy sauce since I’m vegetarian) it was a really nice spicy, salty, thick paste. After adding the tamarind paste and sugar, which I might have done a bit too much of, it became almost like a fruit jam. Not sure if this was the desired effect, or if I just overdid it with the sugar and tamarind (I made my own paste from the dried fruit). I have been cooking Thai recipes for a long time and I have just usually purchased my Prik Pao or Prik Pad in the jar. I was just doing some sauces research and I found your recipe and I can tell you matter of factly that I will never buy store bought again. 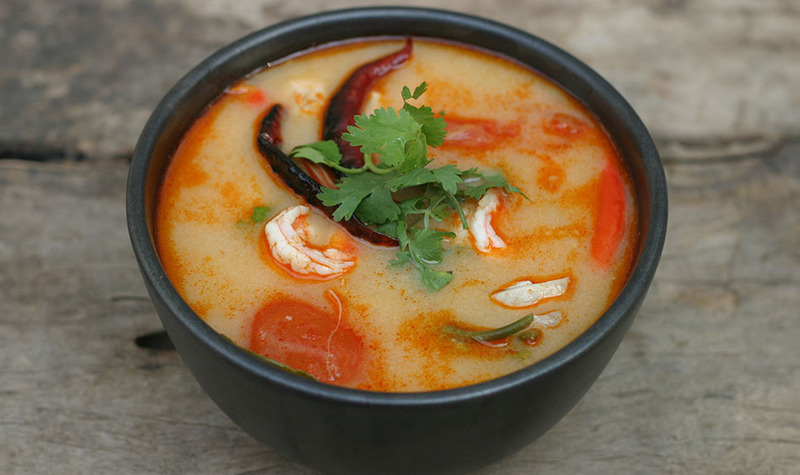 This is an excellent recipe and just what the doctor ordered! Thank you so much for sharing this!